RockBros Polarized Cycling Sunglasses Bike Goggles Run Ride Hike Outdoor Sports Glasses White. Our Polarized lenses are made using an injection process that ensures they’re optically correct, decreasing eye fatigue and increasing comfort. (Confirm your size before u order it). 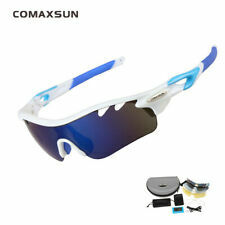 New Professional Polarized Cycling Glasses Bike/Bicycle Sports Sunglasses With 5 Lens STS801. Myopia lens can be attached behind the sunglasses. A Swiss technology, this thermoplastic is the material used in all of our sunglasses. Because you could buy directly from our factory and cut out the middleman. 1 pc Sunglasses. UV400 safety lens, cannot been broken, crack or rust, prevent from ultraviolet light. Shenzhen Yaoflying Sport Component CO., Ltd. located in PingShan District,China. Polarized Lens (58mm). Box & case are included. 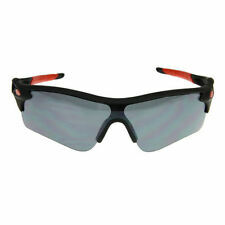 New Professional Polarized Cycling Glasses Bike Bicycle Sports Sunglasses STS811. 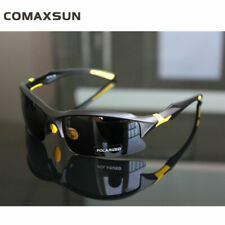 2012 New Cycling bicycle Bike Sports Sun Glasses With 5 lens TSR818. A Swiss technology, this thermoplastic is the material used in all of our sunglasses. Road MTB Bicycle Glasses Motorcycle Sunglasses Eyewear Oculos Ciclismo Unisex Features: 100% Brand new Material: Resin & Plastic Size: As the picture show, Fit for most people Color: as picture (Very slight as the picture shows, Variation in colors may occur due to different display settings) Note: Frame construction using high density resin, light weight and high strength impact resistance, for the best outdoor sports lens material . UV400 safety lens, cannot been broken, crack or rust, prevent from ultraviolet light. lens curvature does not exist a large part of the difference, no distortion and dizziness. Package Content: 1 pc Sunglasses. ROCKBROS Bike Rimless Photochromatic glasses. Speed depends on sunlight and UV intensity! Non-slip nose pads is adjustable. Protection cyclist eyes from UV-400 UV (100% of UV protection). Attributes lenses: Photochromatic. Fashion UV400 Driving Cycling Running Outdoor Sports Sunglasses Eyewear Glasses. Fashion Outdoor Sports UV400 Cycling Riding Driving Sunglasses Eyewear Goggles 1. Fashion Outdoor Sports UV400 Cycling Riding Driving Sunglasses Eyewear Goggles 6. 3 Pairs Motorcycle Wind Resistant Outdoor Cycling Riding Glasses Sunglasses. These 3 pairs of sunglasses have mirror coated UV 400 lenses which provide the ultimate in protection against the sun's harmful rays. Having a quality pair of sports eyewear can help to reduce hazards that you may face while cycling and can increase your performance. Keeping a close watch on the weather can be helpful in making a decision on what to wear to protect your vision while out cycling. No matter what the conditions, there are cycling sunglasses to choose from. These sunglasses are specially designed and shaped to help optimize your performance when cycling. Using a variety of lenses in different colours, these glasses are able to adapt to nearly any weather scenario, and they also maximize your safety when cycling in poor lighting. The shape isn't just for style; this sports eyewear can wrap around your face to protect you from wind turbulence as well. What are the benefits of cycling sunglasses? Quality cycling eyewear can protect your eyes from a variety of hazards, such as bugs and dirt, which can get in your eyes and make it difficult to see, creating a dangerous situation for you and any other cyclists that may be in your path. This could pose some danger if moving at a high speeds where crashing could cause serious injury. A good pair of cycling sunglasses can also protect your eyes from the turbulence caused by riding fast, such as when going downhill. This turbulence can make your eyes water, which distorts your vision and can cause discomfort. What colour of cycling glasses should you use? Low contrast - This can be especially hazardous as you might not be able to notice branches or other debris that could cause a wipeout. Use a lens colour such as brown (or other similarly darker shade) to help improve the contrast, so you can see camouflaged debris. High brightness - This can be countered with glasses that have a darker shade to reduce glare. Another option is a lighter shade with a mirrored coating, which also reduces the glare. Fog/haze - Use sunglasses with a lens colour such as green or copper to reduce glare while also helping to increase contrast. Variable - Sometimes weather changes suddenly. Having sunglasses with a photochromic lens that can change shade depending on the current light can help you to adjust to whatever weather conditions you might have to face. Other - Bugs and the wind may be an issue during night rides, and having a clear lens can help keep the bugs and dirt out of your eyes while minimally interfering with the natural light.